Perfect Seal™ is an innovative new product that takes the guesswork out of toilet installation. 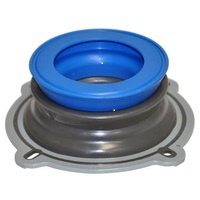 It fits any drain size and flange depth. Whether your flange is above the floor or below the floor due to re-tiling, the Perfect Seal™ guarantees a perfect seal the first time, every time. The patented seal design combines specially designed rubber gaskets with encapsulated wax to form a seal that is three times stronger than a wax ring without the mess. Unlike wax rings, the Perfect Seal™ stabilizes toilet bolts and allows the toilet to be repositioned as needed. It accommodates flange heights from 1/2 in. above the floor to 1-1/2 in. below the floor and maintains a tight seal when common toilet and floor movement occurs. Depending upon the height of the floor flange and the toilet horn, there may be instances when the toilet may not sit flush to the floor. In these situations, the black plastic ring that is inside the gray rubber casing of the Perfect Seal™ can be removed. The removal of this hard plastic ring will allow the Perfect Seal™ to be fully compressed and the toilet should then sit flush with the floor.